Two lieutenant governors, the head of the USO and the wife of a military hero will serve as race officials for the 2015 Coca-Cola 600, the nation’s largest Memorial Day Celebration. Mrs. Dawn Seif will be Grand Marshal; USO CEO & President J.D. Crouch II will be Co-Grand Marshal; West Virginia Senate President-Lt. Gov. Bill Cole will serve as Honorary Starter; and North Carolina’s Lt. Gov. Dan Forest will serve as Honorary Race Director for the 56th running of NASCAR’s only 600-mile race at the famed Charlotte Motor Speedway on Sunday, May 24. As race officials, Senator Cole and Lt. Governor Forest will be honored at a pre-race event, attend the official drivers meeting, address the crowd of more than 130,000 fans, participate in the pre-race spectacular and present the trophy to the winning driver in Victory Lane. As Co-Grand Marshal, Crouch will introduce Seif as the Grand Marshal. Seif will give the race command, while Senator Cole will wave the green flag over the 43-car field to start NASCAR’s most challenging race. As Honorary Race Director, Lt. Gov. Forest will ride in an official pace car. Dawn Bredeweg and SSgt. Andrew C. Seif of Holland, Michigan were married on September 18, 2010. Tragically, SSgt. Seif was one of 11 service members killed in March of this year when their helicopter crashed during a training mission near Eglin Air Force Base, Florida. He was a Combat Engineer based out of Camp Pendleton and Twentynine Palms, CA from 2006 until 2009. He then joined Marine Special Operations Command (MARSOC) based out of Camp Lejeune. During his career, he served one tour of duty in Iraq and two in Afghanistan. SSgt. Seif was a decorated Marine. In July 2012, he faced enemy fire to save a mortally wounded friend in Afghanistan. For his heroism, SSgt. 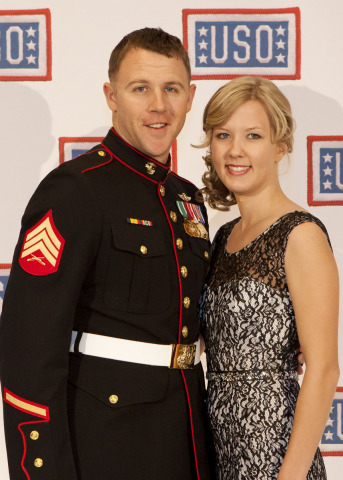 Seif was a recipient of the USO’s 2013 Marine of the Year Award and earned the Silver Star. J.D. Crouch II was elected by the USO Board of Governors to become the 23rd President and Chief Executive Officer of the United Service Organizations (USO) in 2014. Crouch has a long history of public service, including numerous military honors and a service as U.S. Ambassador to Romania. W. Va. Senate President-Lt. Governor Bill Cole is a fifth generation West Virginia businessman. In January 2015, he became the first Republican to lead the W. Va. Senate in more than 80 years. He and his wife, Brownie, live in Bluefield, W. Va. and have four children. Dan Forest is the first Republican Lieutenant Governor to be elected in North Carolina in more than 20 years, and only the second since 1897. Dan is an architect. He and his wife, Alice, reside in Raleigh with their four children, ages 8 to 20. Continuing its tradition as the biggest Memorial Day Weekend celebration in America, the Coca-Cola 600 pre-race show will pay tribute to veterans and active duty members of the U.S. Armed Forces. The captivating performance will showcase ground exercises with troops from Fort Bragg, featuring Humvees, Howitzers, a High Mobility Artillery Rocket System and more. Rope teams from Fort Campbell will descend from Black Hawk helicopters. The high-powered pre-race show will also include a 21-gun salute from the Fort Bragg firing squad and vintage war bird air parade and sky-diving members of Team Fastrax descending into the infield. There will also be a musical element to the pre-race show with performances including Rock and Roll Hall of Famers ZZ Top and Lee Greenwood. Coca-Cola has been involved with stock car racing for more than 50 years and has been the official sparkling beverage of NASCAR since 1998. Through its partnerships with International Speedway Corporation, Speedway Motorsports, Inc. and Indianapolis Motor Speedway, Coca-Cola refreshes racing fans at the majority of NASCAR-sanctioned tracks. A signature part of the brand’s NASCAR association is the Coca-Cola Racing Family – a group of top drivers that include Greg Biffle, Austin Dillon, Denny Hamlin, Joey Logano, Ryan Newman, Danica Patrick and Tony Stewart. Coca-Cola Racing Family members make appearances and are featured in advertising, promotions and on packaging. Great seats are still available for the Coca-Cola 600 and all rest of the 10 Days of NASCAR Thunder, with weekend passes starting at just $99. To purchase tickets and camping day upgrades, fans should call the speedway ticket office at 1-800-455-FANS (3267) or shop online at www.charlottemotorspeedway.com.